Alaska Airlines and Apolo Ohno today unveiled a specially themed Boeing 737-800 adorned with an autographed image of the Olympic-champion speed skater and "Dancing With The Stars" winner. We've seen a lot of team and organization-inspired airline designs (keyword search: planes), but I'm not sure I've ever seen one so prominently featuring an individual personality. 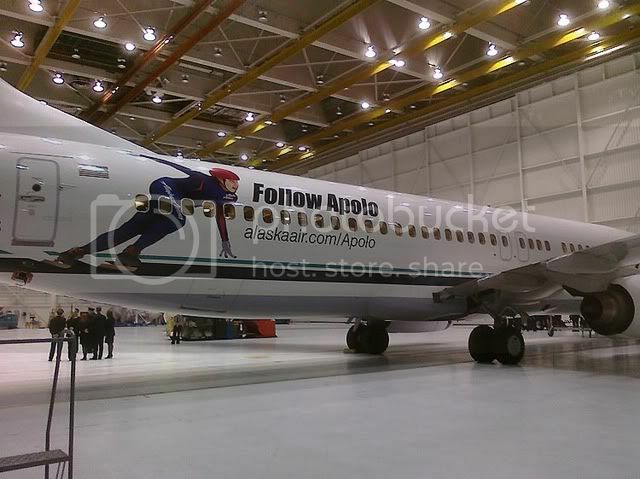 The design features the Seattle native on the aircraft's fuselage and invites travelers to "Follow Apolo" at www.followapolo.com as he pursues the gold medal in Vancouver. "Apolo is one of the most decorated Olympians in history, and we're thrilled to support him on his road to Vancouver," said Brad Tilden, Alaska's president. "The ‘Follow Apolo' jet will fly across our route system to build excitement for this great American athlete." On www.followapolo.com, fans can track Ohno's quest to become the most decorated winter athlete in U.S. history, view behind-the-scenes training videos, sign up to receive e-mail updates from Ohno, and send questions to his blog. "It's an honor to be featured alongside Alaska's trademark Eskimo and have the support of my hometown airline for the most important race of my life," said Ohno, after seeing the plane for the first time. A team of Seattle-area youth speed skaters aspiring to follow in Ohno's path help unveil the aircraft today at Seattle-Tacoma International Airport. Ohno is a native of the Seattle area. To celebrate Ohno's race for gold, passengers boarding the "Follow Apolo" jet received Ohno trading cards, copies of Ohno's signature bandana and press-on faux facial hair. Alaska Airlines and sister carrier Horizon Air together operate 13 flights a day to Vancouver from several West Coast cities. If commercial isn't your thing, then check out our recent story on Fame Route.